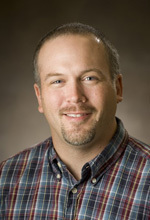 Greg Smith, a member of the college's faculty since 2003, earned his Ph.D. from the University of Oregon in 2001 and completed his post-doctoral work at the University of Wisconsin-Madison in 2003. He is co-founder of the Lakeland Undergraduate Research Experience (LURE), which allows students to work alongside their faculty as peers in conducting primary research. Among courses Smith designed or co-designed at Lakeland are bioinformatics, scientific analysis and writing I, and scientific analysis and writing II. Smith partnered with fellow biology faculty member Paul Pickhardt to create Lakeland's tropical biology course in Belize, a hands-on opportunity to conduct research in the rainforest. Smith serves as the pre-nursing program advisor and the college's Commencement Grand Marshal.